It's not like I or my friends invented the term, but we certainly felt like we did growing up. Summer Songs - for the uninitiated - refers to the kind of music that you would "cruise" the highways and byways with the windows open (or if you were lucky enough), ride with the top down blaring. It's a little hard to define but it's a definate feeling. Journey's Escape or Frontiers. Then you can throw in a few singles such as Tom Cochrane's Life is a Highway, Level 42's Something About You, Meatloaf's Paradise By The Dashboard Light, Rush's Spirit of Radio. Pop it in a blender, mix well and you've got a perfect recipe for summer. Level 42 - Retroglide: These guys have been making music for years despite only a handful of their songs making it to US Radio. They recently reunited (a theme you will find here) and put out one heck of an album. It's melodic, soulful, hook laden and a pleasure to listen to. Standout Tracks - Dive Into The Sun. Asia - Phoenix: What? Asia? Are you kidding me? No, I'm not and their original line up is back together. This is the album that SHOULD have followed up their smash hit debut album. It's very introspective and smells of summer radio. Asia has the interesting ability to compress a prog rock song into 4-5 minutes and do it well. Standout Tracks - An Extrordinary Life, Never Again. The Hooters - Time Stand Still: I told you there was a theme here. From the guys who brought you such hits as And We Danced, Day By Day, All You Zombies - it's an album of fresh new material. It's not that the Hoots ever got out of the biz, they went behind the scenes a wrote for other artists... but there is something wonderful about the sound of The Hooters. The combination of instruments, Eric and Robs unique voices, the playful quality of the music. They sound fantastic. Standout Tracks - Time Stand Still, Boys of Summer (neat remake of the Henley tune), Until You Dare, I'm Alive. Francis Dunnery - Gulley Flats Boys: Francis was the voice of the pop/rock genius band It Bites (if you havn't heard of them - check out their greatest). Turns out he's been producing music all these years since they broke up in the 80's and this has to be one of his best. Stripped down and bare bones, his music and introspective stories shine. There isn't a track that I don't like on this album. Listen to on the beach while sipping your favorite beverage. Standout Tracks - Soldier, Autumn The Rain Man, Living in New York City, Joy. So there you have it. Summer Sounds for your iPod, your Windows Media Phone, your home stereo or most preferably, your vehicle. Set it on cruse control - take a spin if you can afford the gas, or just sit in the drive with the windows down and pretend your drivin' 65. Any way you slice it, some good music helps get the season kick started. In Loving Memory - John F. Yaglenski Sr.
John F. Yaglenski, Sr., 92, Venice, formerly of Pennsylvania died Jan. 25, 2008. A Mass of Christian Burial will be at 10 a.m. Thursday at Epiphany Cathedral, with burial to follow in Epiphany Gardens. Survivors include his wife, Mary; a son, John Jr.; three grandchildren John, Gary and Matthew; and five great-grandchildren - Michael, Andrew, Thomas, Brien and Katherine. John moved to Venice in 1996. He was a member of Epiphany Cathedral, Knights of the Holy Sepulchre and Knights of Columbus Council 7052. He retired as a Major and Director of the Bureau of Criminal Investigations of the Pennsylvania State Police. In lieu of flowers, donations can be made to Catholic Charities Sugar Bowl Fund (Diocese of Venice), 1000 Pinebrook Road, Venice, FL 34285. Don't undersell your services - sell QUALITY. Sell yourself, your business, your responsiveness, your reputation. Word will get around. Who said that? Me. Funny when you hear yourself quoted. I posted that in response to a thread on AmayaUsers.com talking about your competition undercutting you and had someone quote it back to me. Made me chuckle. My wife runs an Commercial Embroidery Business and it's taken a 3-4 years to build to the point where we are just about to break thru. It's very satisfying to see that kind of progress. We built this. Customers love us. The thing is, it applies to most everything we do. In my spare time (joke), I run one of the largest Walt Disney World travel sites on the internet... http://www.intercot.com - and we have been tempted over the years to cut corners, rush to decisions, launching products, services - whatever. Things that would have broken my vision - but the decision always has been to grow slow. Never have sacrifice quality. Here we are 10 years later (this October) after things began as an experiment in Web Design and Meta Tags. Now recognized officially by Disney, sponsorship for the site at an all time high, and a wonderful staff and loyal community that is absolutely, hands down, the most friendly and caring bunch of folks you ever could meet. I couldn't have done it without a tremendous staff (Carol, Gary, Mel... in the early years Gale, Patricia, and a host of others along the way that believed in INTERCOT). I am absolutely amazed and humbled to be in the position I am. Luck? No. Attention to detail and a long term vision? Yes. UPDATE: Fix didn't work for me. Maybe in Vista SP1 this will be fixed.... don't hold your breath. I havn't tried it myself yet as I long ago removed vista because it was too early but plan on migrating my laptop to it in the next few days. I'll let you know how it goes. So, I ordered my yearly supply of Dayton Flyer apparel from the University of Dayton Bookstore website the other day. In my order was a "dry release" tshirt, which is a nice way of saying microfiber, which is a nice way of saying polyester, only we pay way more for dry release than we would if the tag actually said polyester.... but I digress. Aside from the fact that I tend to like the "dry release" or "dry fit" shirts since I seem to perspire a bit... I noticed that the shirt also had "FreshGuard". What is this strange animal. FreshGuard? Hadn't heard of that before but it sounded interesting. The tag described it as something that "neutralizes odor safely" and "keeps clothes fresh". Holy crap! There is actually technology in my shirt that keeps it smelling good? Why the heck doesn't eveything I own have this. I now want it. Where has it been all my life! So on top of Dry Release technology that "removes perspiration fast", "dries 4x faster than cotton", is "soft feeling", "won't shrink or lose shape" and "resists pilling" (I HATE pills)... I now can have that fresh feeling all day long! It's a wonderful age of nanotechnology we live in. The company that makes this is Optimer. I may just have to see if they are publicly traded. FreshGuard for product of the year! It's a sunny, relatively warm day for March in the nation's capitol and I am feeling slightly energetic, thus the decision to post here on my nearly abandoned blog. Actually, it hasn't been abandoned, but certainly posting on the home page has lacked while I have added information to other sectons. So, what's new you ask? Well, I turned 40 in November and made a decision shortly before - that life was going to change. What that meant to me was I was tired with all the crap that had been piling on over the years on the health side of things. Low good colesterol, high bad colesterol, high blood pressure, sleep apnea - the list goes on. So, I decided to take charge. Most of these items were related to me being overweight. At 5'9", I had tipped the scales at 202. It was one of those 5 lb a year programs where your weight just kept going up year after year, until finally you hit a magical number... for me 200... and you say "holy crap - I am fat!". So, I found NutriSystem. In the space of a few months, I had lost my goal - which was to get to 175 and the weight kept coming off. I finally stopped loosing after settling at between 158 and 159 which is where I am today. A lot of people were skeptical of the whole NutriSystem diet but I have to say, it honestly worked. Better yet, it actually taught me how to eat. For almost the last 3 months now, I have only been supplimenting with NutriSystem food - which means I am eating healthy on my own. This means I am actually making GOOD CHOICES. For me, it was all about portion control and cutting out sugar. I'm a nutrisweet/splenda dude now. No more million calorie starbucks drinks, no more 2 pop tarts for breakfast. I look and feel better.. And thats a good thing. And in an appropriate end to 2006, I put a foot thru my ceiling today. No crap. I really did. In the process of getting the attic ready to store the Christmas stuff for another season, I decided to put down long needed floor board. We had a little bit in our attic, but a lot more was needed. It was always a trick avoiding falling thru the ceiling. Can you just smell the irony there? Anyway, my son Michael was helping me and as I was moving around, I lost my balance. That ugly feeling you get when you know something bad is about to happen washed all over me as I saw my foot hit the Sheetrock ceiling. Worse yet, I hit it right in the middle of two pieces of Sheetrock thereby increasing the hole's girth. Did I mention that the hole is in the middle of the family room. Crap. Crappity Crap Crap. So, made a call to Pedro, our painter and asked him if he did drywall repair - he's coming tomorrow. The good thing is this happened in 2006. Tonite brings a fresh start. And things look better for the record for 2007. For the first time ever, Disney has recognised our website and has invited me to a press event - for what appears to be all expenses paid. Google ad revenues are up and local advertisers seem to be doing well. My wife's business (Embroidery) seems to be picking up thanks to a solid listing in Google. Just search Frederick Maryland Embroidery. Money is starting to flow again on a personal level after what was probably our worst quarter ever - finance wise. We've now got 3 great dogs and a foster in tow for a total of 4 shelties. Life is pretty good overall. So, while I could be super upset for what I did tonite... I'm not. In fact, I laughed about it. To everyone who still checks here for posts - Happy New Year. Oh, and check out http://www.yaglenski.com to see what I have been up to the for the past month or two! 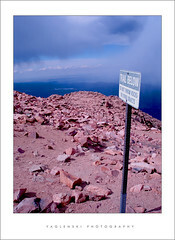 Ok, so it's not 8 miles high, but at 14,000+ feet above sea level, Pike's Peak is quite a site. I am in Denver for a couple of weeks for Tech Training and got the chance to head out this weekend and see the sights. Some of the photos are now online in my Flickr account including the one to the right. In other news, I registered the domain JOHNfm.com and am debating changing the name of Classic Hits fm 88 to 88.7 JOHNfm. It's a trend in the radio industry to call stations by first name. Out here in Denver, there's Jack and Alice. For the country fan among us, there's Willie. Of course there are animals here in Denver as well... The Eagle, The Fox. And for the nostalgic at heart, there's a mix, a kosi (lite fm) and a fan (sports talk of course). I had a huge post on my new Part 15 FM and internet station, but my Mac crashed and took the post with it. So, I am going to make this short and sweet for now. It's creeping up closer than I would like. This November I turn 40 and I have to admit, I am a little bit bummed out. Call it a mid life crisis. Whatever. All I know is I need something to get me out of the funk that I have been in for the better of the last 6 months. It's a combination of a lot of little things and some big ones too. Health issues, kids getting older, stagnation of my career and creativity, feeling like I am in a rut - the list goes on and on. Won't bore you with the details, but I do have a need to shake things up a little bit. Not sure exactly what that means at this point. Maybe I will figure it out in the weeks ahead.